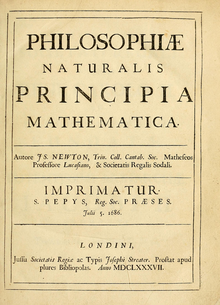 Philosophiæ Naturalis Principia Mathematica (Latin for Mathematical Principles of Natural Philosophy), often referred to as simply the Principia (/prɪnˈsɪpiə, prɪnˈkɪpiə/), is a work in three books by Isaac Newton, in Latin, first published 5 July 1687. After annotating and correcting his personal copy of the first edition, Newton published two further editions, in 1713 and 1726. The Principia states Newton's laws of motion, forming the foundation of classical mechanics; Newton's law of universal gravitation; and a derivation of Kepler's laws of planetary motion (which Kepler first obtained empirically). The Principia is considered one of the most important works in the history of science. The French mathematical physicist Alexis Clairaut assessed it in 1747: "The famous book of Mathematical Principles of Natural Philosophy marked the epoch of a great revolution in physics. 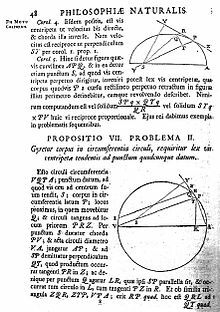 The method followed by its illustrious author Sir Newton ... spread the light of mathematics on a science which up to then had remained in the darkness of conjectures and hypotheses." Newton's proof of Kepler's second law, as described in the book. If a continuous centripetal force (red arrow) is considered on the planet during its orbit, the area of the triangles defined by the path of the planet will be the same. This is true for any fixed time interval. When the interval tends to zero, the force can be considered instantaneous. (Click image for a detailed description). Part of the contents originally planned for the first book was divided out into a second book, which largely concerns motion through resisting mediums. Just as Newton examined consequences of different conceivable laws of attraction in Book 1, here he examines different conceivable laws of resistance; thus Section 1 discusses resistance in direct proportion to velocity, and Section 2 goes on to examine the implications of resistance in proportion to the square of velocity. Book 2 also discusses (in Section 5) hydrostatics and the properties of compressible fluids. The effects of air resistance on pendulums are studied in Section 6, along with Newton's account of experiments that he carried out, to try to find out some characteristics of air resistance in reality by observing the motions of pendulums under different conditions. Newton compares the resistance offered by a medium against motions of globes with different properties (material, weight, size). In Section 8, he derives rules to determine the speed of waves in fluids and relates them to the density and condensation (Proposition 48; this would become very important in acoustics). He assumes that these rules apply equally to light and sound and estimates that the speed of sound is around 1088 feet per second and can increase depending on the amount of water in air. Only I must observe, that the vulgar conceive those quantities under no other notions but from the relation they bear to perceptible objects. And it will be convenient to distinguish them into absolute and relative, true and apparent, mathematical and common. ... instead of absolute places and motions, we use relative ones; and that without any inconvenience in common affairs; but in philosophical discussions, we ought to step back from our senses, and consider things themselves, distinct from what are only perceptible measures of them. Isaac Newton's statement of the four rules revolutionised the investigation of phenomena. With these rules, Newton could in principle begin to address all of the world's present unsolved mysteries. 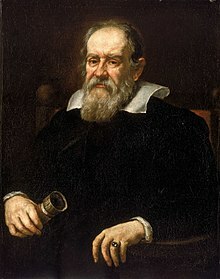 He was able to use his new analytical method to replace that of Aristotle, and he was able to use his method to tweak and update Galileo's experimental method. The re-creation of Galileo's method has never been significantly changed and in its substance, scientists use it today. Descartes' book of 1644 Principia philosophiae (Principles of philosophy) stated that bodies can act on each other only through contact: a principle that induced people, among them himself, to hypothesize a universal medium as the carrier of interactions such as light and gravity—the aether. Newton was criticized for apparently introducing forces that acted at distance without any medium. Not until the development of particle theory was Descartes' notion vindicated when it was possible to describe all interactions, like the strong, weak, and electromagnetic fundamental interactions, using mediating gauge bosons and gravity through hypothesized gravitons. Although he was mistaken in his treatment of circular motion, this effort was more fruitful in the short term when it led others to identify circular motion as a problem raised by the principle of inertia. Christiaan Huygens solved this problem in the 1650s and published it much later in 1673 in his book Horologium oscillatorium sive de motu pendulorum. The Huntington Library in San Marino, California owns Isaac Newton's personal copy, with annotations in Newton's own hand. The Linda Hall Library holds the first edition, as well as a copy of the 1713 and 1726 editions. The Teleki-Bolyai Library of Târgu-Mureș holds a 2-line imprint first edition. Newton's personal copy of the first edition of Philosophiæ Naturalis Principia Mathematica, annotated by him for the second edition. Displayed at Cambridge University Library. ^ a b Volume 1 of the 1729 English translation is available as an online scan; limited parts of the 1729 translation (misidentified as based on the 1687 edition) have also been transcribed online. 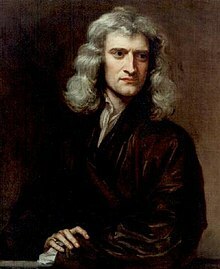 ^ Newton, Isaac. "Philosophiæ Naturalis Principia Mathematica (Newton's personally annotated 1st edition)". ^ J M Steele, University of Toronto, (review online from Canadian Association of Physicists) Archived 1 April 2010 at the Wayback Machine of N Guicciardini's "Reading the Principia: The Debate on Newton's Mathematical Methods for Natural Philosophy from 1687 to 1736" (Cambridge UP, 1999), a book which also states (summary before title page) that the "Principia" "is considered one of the masterpieces in the history of science". ^ a b The content of infinitesimal calculus in the 'Principia' was recognized both in Newton's lifetime and later, among others by the Marquis de l'Hospital, whose 1696 book "Analyse des infiniment petits" (Infinitesimal analysis) stated in its preface, about the 'Principia', that 'nearly all of it is of this calculus' ('lequel est presque tout de ce calcul'). See also D T Whiteside (1970), "The mathematical principles underlying Newton's Principia Mathematica", Journal for the History of Astronomy, vol.1 (1970), 116–138, especially at p.120. ^ a b Or "frame" no hypotheses (as traditionally translated at vol.2, p.392, in the 1729 English version). ^ The De motu corporum in gyrum article indicates the topics that reappear in the Principia. ^ Newton, Sir Isaac (1729). "Definitions". The Mathematical Principles of Natural Philosophy, Volume I. p. 1. ^ Newton, Sir Isaac (1729). "Axioms or Laws of Motion". The Mathematical Principles of Natural Philosophy, Volume I. p. 19. ^ Newton, Sir Isaac (1729). "Section I". The Mathematical Principles of Natural Philosophy, Volume I. p. 41. ^ Newton, Sir Isaac (1729). "Section II". The Mathematical Principles of Natural Philosophy, Volume I. p. 57. ^ Newton, Sir Isaac; Machin, John (1729). The Mathematical Principles of Natural Philosophy, Volume I. pp. 79–153. ^ Newton, Sir Isaac (1729). "Section IX". The Mathematical Principles of Natural Philosophy, Volume I. p. 177. ^ Newton, Sir Isaac (1729). "Section XI". The Mathematical Principles of Natural Philosophy, Volume I. p. 218. ^ Newton, Sir Isaac (1729). "Section XI, Proposition LXVI". The Mathematical Principles of Natural Philosophy, Volume I. p. 234. ^ Newton, Sir Isaac; Machin, John (1729). The Mathematical Principles of Natural Philosophy, Volume I. pp. 239–256. ^ Newton, Sir Isaac (1729). "Section XII". The Mathematical Principles of Natural Philosophy, Volume I. p. 263. ^ Newton, Sir Isaac (1729). "Proposition 48". The Mathematical Principles of Natural Philosophy, Volume II. p. 176. ^ Newton, Sir Isaac (1729). "Scholium to proposition 50". The Mathematical Principles of Natural Philosophy, Volume II. p. 181. ^ Eric J Aiton, The Cartesian vortex theory, chapter 11 in Planetary astronomy from the Renaissance to the rise of astrophysics, Part A: Tycho Brahe to Newton, eds. R Taton & C Wilson, Cambridge (Cambridge University press) 1989; at pp. 207–221. ^ Newton, Sir Isaac (1729). "Scholium to proposition 53". The Mathematical Principles of Natural Philosophy, Volume II. p. 197. ^ Newton, Sir Isaac (1729). The Mathematical Principles of Natural Philosophy, Volume II. p. 252. ^ Newton, Sir Isaac (1729). The Mathematical Principles of Natural Philosophy, Volume II. p. 262. ^ Newton, Sir Isaac (1729). "The Phaenomena". The Mathematical Principles of Natural Philosophy, Volume II. p. 206. ^ Newton, Sir Isaac (1729). The Mathematical Principles of Natural Philosophy, Volume II. p. 213. ^ Newton, Sir Isaac (1729). The Mathematical Principles of Natural Philosophy, Volume II. p. 220. ^ Newton, Sir Isaac (1729). The Mathematical Principles of Natural Philosophy, Volume II. p. 323. ^ Newton, Sir Isaac (1729). The Mathematical Principles of Natural Philosophy, Volume II. p. 332. ^ Newton, Sir Isaac (1729). The Mathematical Principles of Natural Philosophy, Volume II. p. 255. ^ Newton, Sir Isaac (1729). The Mathematical Principles of Natural Philosophy, Volume II. p. 305. ^ Newton, Sir Isaac (1729). The Mathematical Principles of Natural Philosophy, Volume II. p. 306. ^ Newton, Sir Isaac (1729). The Mathematical Principles of Natural Philosophy, Volume II. p. 320. ^ See Curtis Wilson, "The Newtonian achievement in astronomy", pages 233–274 in R Taton & C Wilson (eds) (1989) The General History of Astronomy, Volume, 2A', at page 233). ^ Newton, Sir Isaac (1729). "Proposition 12, Corollary". The Mathematical Principles of Natural Philosophy, Volume II. p. 233. ^ a b Newton, Sir Isaac (1729). "Proposition 11 & preceding Hypothesis". The Mathematical Principles of Natural Philosophy, Volume II. p. 232. ^ Newton, Sir Isaac (1729). "Proposition 8, Corollary 2". The Mathematical Principles of Natural Philosophy, Volume II. p. 228. ^ Newton, Sir Isaac (1729). "Proposition 12". The Mathematical Principles of Natural Philosophy, Volume II. pp. 232–233. 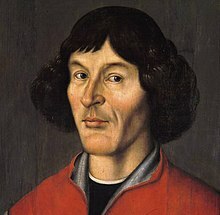 Newton's position is seen to go beyond literal Copernican heliocentrism practically to the modern position in regard to the Solar System barycenter (see Barycenter -- Inside or outside the Sun?). ^ See online Principia (1729 translation) vol.2, Books 2 & 3, starting at page 387 of volume 2 (1729). ^ a b Edelglass et al., Matter and Mind, ISBN 0-940262-45-2, p. 54. ^ See online Principia (1729 translation) vol.2, Books 2 & 3, at page 392 of volume 2 (1729). ^ Snobelen, Stephen. "The General Scholium to Isaac Newton's Principia mathematica". Archived from the original on 8 June 2008. Retrieved 31 May 2008. ^ Ducheyne, Steffen. "The General Scholium: Some notes on Newton's published and unpublished endeavours" (PDF). Lias: Sources and Documents Relating to the Early Modern History of Ideas. 33 (2): 223–274. Retrieved 19 November 2008. ^ Paraphrase of 1686 report by Halley, in H. W. Turnbull (ed. ), 'Correspondence of Isaac Newton', Vol.2, cited above, pp. 431–448. ^ 'Cook, 1998': A. Cook, Edmond Halley, Charting the Heavens and the Seas, Oxford University Press 1998, at pp.147 and 152. ^ As dated e.g. by D. T. Whiteside, in The Prehistory of the Principia from 1664 to 1686, Notes and Records of the Royal Society of London, 45 (1991) 11–61. ^ Cook, 1998; at p. 147. ^ 'Westfall, 1980': R S Westfall, Never at Rest: A Biography of Isaac Newton, Cambridge University Press 1980, at p.404. ^ Cook, 1998; at p. 151. ^ Westfall, 1980; at p. 406, also pp. 191–2. ^ Westfall, 1980; at p.406, n.15. ^ Westfall, 1980; at pp. 153–156. ^ The fundamental study of Newton's progress in writing the Principia is in I. Bernard Cohen's Introduction to Newton's 'Principia' , (Cambridge, Cambridge University Press, 1971), at part 2: "The writing and first publication of the 'Principia' ", pp.47–142. ^ Newton, Sir Isaac (1729). "Introduction to Book 3". The Mathematical Principles of Natural Philosophy, Volume II. p. 200. ^ Newton, Isaac (1728). A Treatise of the System of the World. ^ I. Bernard Cohen, Introduction to Newton's A Treatise of the System of the World (facsimile of second English edition of 1731), London (Dawsons of Pall Mall) 1969. ^ Newton, Sir Isaac (1740). The System of the World: Demonstrated in an Easy and Popular Manner. Being a Proper Introduction to the Most Sublime Philosophy. By the Illustrious Sir Isaac Newton. Translated into English. A 'corrected' reprint of the second edition. 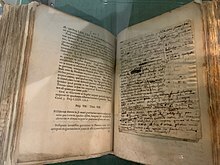 ^ "Museum of London exhibit including facsimile of title page from John Flamsteed's copy of 1687 edition of Newton's ''Principia''". Museumoflondon.org.uk. Archived from the original on 31 March 2012. Retrieved 16 March 2012. ^ Rovelli, Carlo (2000). "Notes for a brief history of quantum gravity". arXiv:gr-qc/0006061. ^ See J. Bruce Brackenridge, "The key to Newton's dynamics: the Kepler problem and the Principia", (University of California Press, 1995), especially at pages 20–21. ^ See page 10 in D T Whiteside, "Before the Principia: the maturing of Newton's thoughts on dynamical astronomy, 1664–1684", Journal for the History of Astronomy, i (1970), pages 5–19. ^ See page 239 in Curtis Wilson (1989), "The Newtonian achievement in astronomy", ch.13 (pages 233–274) in "Planetary astronomy from the Renaissance to the rise of astrophysics: 2A: Tycho Brahe to Newton", CUP 1989. ^ a b c d e H W Turnbull (ed. ), Correspondence of Isaac Newton, Vol 2 (1676–1687), (Cambridge University Press, 1960), giving the Hooke-Newton correspondence (of November 1679 to January 1679/80) at pp.297–314, and the 1686 correspondence over Hooke's priority claim at pp.431–448. ^ 'Correspondence' vol.2 already cited, at p.297. ^ Several commentators have followed Hooke in calling Newton's spiral path mistaken, or even a 'blunder', but there are also the following facts: (a) that Hooke left out of account Newton's specific statement that the motion resulted from dropping "a heavy body suspended in the Air" (i.e. a resisting medium), see Newton to Hooke, 28 November 1679, document #236 at page 301, 'Correspondence' vol.2 cited above, and compare Hooke's report to the Royal Society on 11 December 1679 where Hooke reported the matter "supposing no resistance", see D Gjertsen, 'Newton Handbook' (1986), at page 259); and (b) that Hooke's reply of 9 December 1679 to Newton considered the cases of motion both with and without air resistance: The resistance-free path was what Hooke called an 'elliptueid'; but a line in Hooke's diagram showing the path for his case of air resistance was, though elongated, also another inward-spiralling path ending at the Earth's centre: Hooke wrote "where the Medium ... has a power of impeding and destroying its motion the curve in wch it would move would be some what like the Line AIKLMNOP &c and ... would terminate in the center C". Hooke's path including air resistance was therefore to this extent like Newton's (see 'Correspondence' vol.2, cited above, at pages 304–306, document #237, with accompanying figure). The diagrams are also available online: see Curtis Wilson, chapter 13 in "Planetary Astronomy from the Renaissance to the Rise of Astrophysics, Part A, Tycho Brahe to Newton", (Cambridge UP 1989), at page 241 showing Newton's 1679 diagram with spiral, and extract of his letter; also at page 242 showing Hooke's 1679 diagram including two paths, closed curve and spiral. Newton pointed out in his later correspondence over the priority claim that the descent in a spiral "is true in a resisting medium such as our air is", see 'Correspondence', vol.2 cited above, at page 433, document #286. ^ See Curtis Wilson (1989) at page 244. ^ See "Meanest foundations and nobler superstructures: Hooke, Newton and the 'Compounding of the Celestiall Motions of the Planetts'", Ofer Gal, 2003 at page 9. ^ See for example the 1729 English translation of the 'Principia', at page 66. ^ Newton, Isaac. "Philosophiæ naturalis principia mathematica". Cambridge Digital Library. Retrieved 3 July 2013. ^ Newton, Isaac (1687). "Philosophiae naturalis principia mathematica" (in Latin). Swem Library: Jussu Societatis Regiae ac Typis Josephi Streater. Archived from the original on 15 December 2012. ^ "Special Collections & University Archives". stanford.edu. ^ "The Crawford collection at the Royal Observatory Edinburgh". The Royal Observatory, Edinburgh. Retrieved 3 July 2013. ^ "Newton's book back in Uppsala University Library". Uppsala University. Retrieved 10 May 2014. ^ "Beautiful Science: Ideas that Changed the World – Astronomy". Retrieved 2 January 2016. ^ "A scientific gem: Isaac Newton (1643-1727)". Retrieved 5 July 2016. ^ "Echoes from the Vault". Echoes from the Vault. Retrieved 6 November 2017. ^ "Annotated first edition copy of Newton's Principia". University of Sydney Library. University of Sydney. Retrieved 17 April 2019. ^ Rawlinson, Kevin (15 December 2016). "Isaac Newton masterwork becomes most expensive science book sold". The Guardian. Retrieved 19 December 2016. ^ The Correspondence of Isaac Newton, vol.4, Cambridge University press 1967, at pp.518–20. ^ The Correspondence of Isaac Newton, vol.5, Cambridge University press 1975. Bentley's letter to Newton of October 1709 (at pp. 7–8) describes Cotes' perhaps unenviable position in relation to his master Bentley: "You need not be so shy of giving Mr. Cotes too much trouble: he has more esteem for you, and obligations to you, than to think that trouble too grievous: but however he does it at my Orders, to whom he owes more than that." ^ See "Translating Newton's 'Principia': The Marquise du Châtelet's Revisions and Additions for a French Audience." Author(s): Judith P. Zinsser Source: Notes and Records of the Royal Society of London, Vol. 55, No. 2 (May 2001), pp. 227–245. ^ See pages 29–37 in I. Bernard Cohen (1999), "A Guide to Newton's Principia", published as an introduction to Isaac Newton: The Principia, Mathematical principles of natural philosophy, a new translation by I Bernard Cohen and Anne Whitman, University of California Press, 1999. ^ Isaac Newton: The Principia, Mathematical principles of natural philosophy, a new translation by I. Bernard Cohen and Anne Whitman, preceded by "A Guide to Newton's Principia" by I. Bernard Cohen, University of California Press, 1999, ISBN 978-0-520-08816-0, ISBN 978-0-520-08817-7. ^ Densmore and Donahue, pp. xv–xvi. ^ "Tim Peake mission name pays tribute to Isaac Newton". BBC News. François De Gandt, Force and geometry in Newton's Principia trans. Curtis Wilson (Princeton, NJ: Princeton University Press, c1995). Steffen Ducheyne, The main Business of Natural Philosophy: Isaac Newton's Natural-Philosophical Methodology (Dordrecht e.a. : Springer, 2012). ETH-Bibliothek Zürich. From the library of Gabriel Cramer. This page was last edited on 17 April 2019, at 06:50 (UTC).